This long-awaited comeback of sorts is a joyful, intense and occasionally humorous experience. 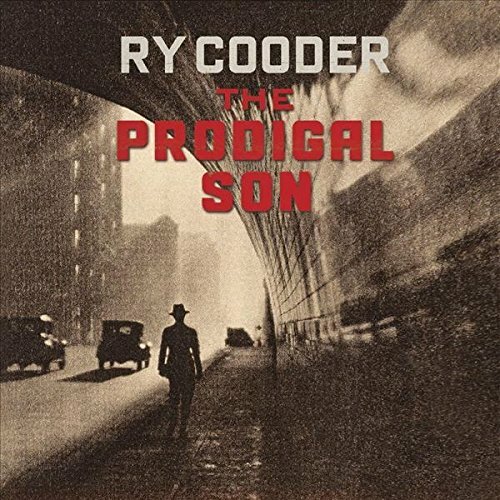 Long-time followers of Ry Cooder’s eclectic and winding five-decade career may look at The Prodigal Son, his first new album in six years, as a closure of sorts. After all, Cooder’s 1970 debut included covers of songs penned by Blind Willie Johnson and Blind Alfred Reed, and they both appear as writers on this set. Cooder also name checks Woody Guthrie in this disc’s original “Jesus and Woody.” He covered Guthrie’s “Do Re Mi” on that self-titled release nearly 50 years ago. More pointedly, Cooder has returned to a similar basic blueprint of stripped-down gospel, backwoods and folk blues that got him started on his twisting musical journey all those years ago. His accomplishments are far too long to recap here, but anyone who has worked with artists as diverse as Captain Beefheart, the Rolling Stones, Ali Farka Toure, Taj Mahal, David Lindley, Flaco Jimenez and Cuba’s Buena Vista Social Club among many others deserves a spot on any living legend list. For The Prodigal Son, Cooder and son/percussionist Joachim dig deep into the well of American music to excavate songs from classic gospel, Dust Bowl folk and blues artists that, without preaching, resonate with socio-political themes meant to illuminate today’s fractious environment. He adds three of his own compositions, such as the dryly humorous New Orleans-styled R&B of “Shrinking Man” that sound as if they were written 100 years ago and comfortably slot into the vibe of the rest of these covers. Cooder takes the basic lyrics of the Stanley Brothers’ spiritual “Harbor of Love,” slows the tempo and makes it sound as fresh as if it was penned last week. You don’t have to know much about the current immigrant situation to understand how Cooder’s cover of Blind Willie Johnson’s “Everybody Ought to Treat a Stranger Right” reflects on the present administration’s policy. And when Cooder whips out his slide solo at 1:30 into the song, it’s a moment arguably as powerful as any in his long history. An amped-up arrangement of the traditional title track with the lyrics, “the father asked the prodigal, did you smell the sweet perfume and hear the angel band?/ He said dim lights, thick smoke and loud, loud music is the only kind of truth I’ll ever understand,” is a floor-filling rocker and one of this disc’s undisputed highlights. Cooder expands “Nobody’s Fault but Mine,” another Johnson tune, into a five-minute tour de force as he moans, “Jesus taught me what to do, and Buddha taught me what to do/ If I don’t do right my soul will be lost” over a dark, ominous drone that’s as edgy and frightening as anything any heavy metal band ever played. The album loses a little steam with a few too many ballads in its final third until closing with the upbeat churchy grinder “In His Care.” But this long-awaited comeback of sorts for Cooder is a joyful, intense and occasionally humorous experience that any Americana fan will enjoy. He’s touring for the first time in many years to spread the word, so hopefully this is not the end, but a start of yet another phase of Ry Cooder’s celebrated and colorful career.